There is nothing better than an oracle octopus wouldn't you say? I love to come in to work and read a good news story, one that's lighthearted, where the players are all having a laugh and no-one is getting too serious about things. 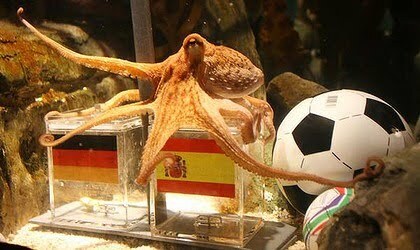 Except the German's of course, but I must admit, I would be looking for my best calamari recipe too if an Octopus had predicted my defeat in my quest for that holiest of holy grails, the Soccer World Cup. And yes, it is Soccer, not football! Don't know what I'm talking about? Then hop on over, to the Sydney Morning Herald and read about Paul, the 'psychic' octopus who has correctly predicted the wins and losses of several World Cup matches. While not big news, it's news that puts a smile on my face on a Friday morning and doesn't make me want to scream at my screen! Hope it puts a smile on yours. Now, I'm off to google calamari recipes for dinner tonight, I got a craving! Oh, I'm loving Paul too. Octopus (pi? puses?) are bizarre enough on their own. But a psychic one takes the cake? And then the fact that his name is Paul is just the cherry on top!